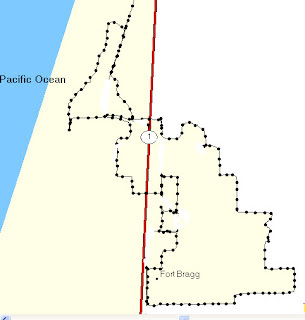 I have often thought about offering a personal guided tour of my Fort Bragg Oddities Walk brochure but I had never actually walked the complete route in one "sitting". I was curious as to how short a walk I could make it while still including all the "Oddities". Saturday I gave it a try and used my GPS to record my route and distance. I included all the tie-down rings, Glass Beach, out to the middle of the Pudding creek trestle, Wall Street, the Boat House, the Donnor Party folks, "Shooting" the Vortex and even tossed in a stroll through Otis Johnson park. End results. 6.1 miles in 2 hours and 15 minutes. Perfect! I'm going to see if the MCLandLopers are interested in giving it a try. That is the distance and time frame they usually do. A great variety of houses along the way. Remember this house being repainted last Fall? They chose a dark smoky purple trim. Great touch! And guess what! More evidence of Spring coming! On a nice day this could be a lot of fun. We'll see.